Focusing on defense first, the Finns capitalized on Danish mistakes, and Denmark just wasn’t equipped to return the favor. It was classic Finnish hockey from Kari Jalonen’s men. The result was no surprise. Heading into the semi-finals, Finland remains the tournament’s only team with a perfect record, and its goal differential is now an impressive 34-7. 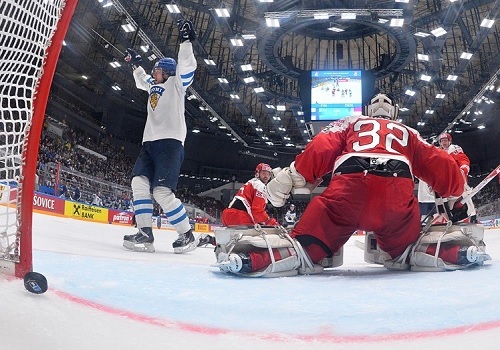 Finnish starting goalie Mikko Koskinen made 16 saves for the victory, while Denmark’s Sebastian Dahm had 23 stops. Star Finnish center Aleksander Barkov sat out with the flu and Jani Lajunen took his place on the Laine line. Overall, it’s a positive sign for the Danes as they look forward to hosting the IIHF World Championship for the first time ever in 2018 (Copenhagen and Herning). They’ve kept their place in the elite division continuously since 2003. From this tournament, Denmark can take pride in accomplishments like defeating the Czech Republic for just the second time in Worlds history. The red-and-white team came in with the tournament’s best power play, converting at 34.6 percent. Denmark got the game’s first opportunity when Koivu was penalized for up-ending Nikolaj Ehlers in the neutral zone. It lasted just 12 seconds, however, as Danish captain Morten Green was caught holding Mika Pyorala along the side boards. The Danes had the best chance 4-on-4 when Storm ditsy-doodled past the Finnish defense and set up team goal-scoring leader Nicklas Jensen in the slot. However, the Danish defense would commit more costly errors as the quarter-final wore on. “With a little bit of luck on our side we might have been even more competitive,” said Storm. “Laine’s goal was a tough one for us,” said Karlsson. The Danes pulled Dahm for the extra attacker, and Jokinen out-muscled two Danish backcheckers to add the empty-netter with 2:14 left. Granlund made it 5-1 for his 11th point of the tournament just 21 seconds later, gobbling up a giveaway by blueliner Daniel Nielsen. Soon, after the final siren, the Finns were exchanging business-like, congratulatory fist bumps. Denmark’s three best players of the tournament were announced: Sebastian Dahm, Nicklas Jensen, and Daniel Nielsen.